The test piece wouldn't scratch the piece C (unhardened control) in this state, so I reheated it to cherry red and plunged it again in cold water. It did after that scratch piece C, showing that it did case harden to some degree using sugar without air. The X shaped marks are the scratches from the case hardened rod. You can also see in this photo how deeply piece A cut into the Control piece in the earlier samples experiment -- it left the notch on the left side of the photo. 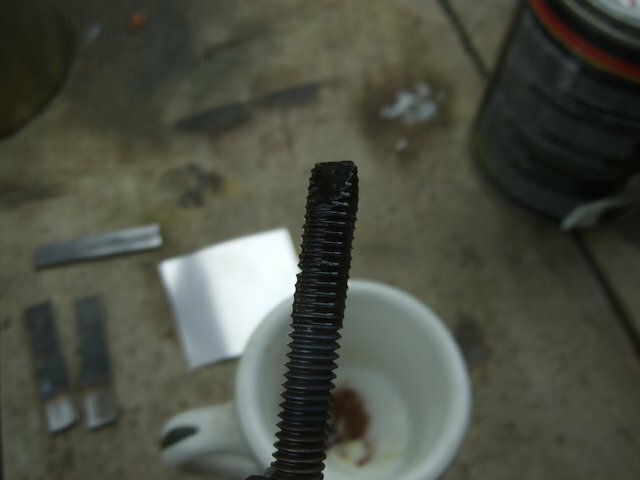 Testing the sugar case hardened threaded rod against hardened pieces A and S showed it wasn't as hard as either. Neither could be scratched with it. That's an end to my sugar testing for now. Have you ever tried to work a piece of LC steel that was flame cut? During that (flame cut) process the carbon in the steel migrates from within the part to the cut edge/surface and becomes quite hard. That can be one of the effects you are seeing. Carburizing, on the other hand, is the migration of carbon from the pack into the part. This process most readily occurs when the part is heated to (and held) slightly above the Curie Point (which is the temperature causes a change in the crystal structure of the iron/steel such that it is no longer significantly affected by magnetic fields). 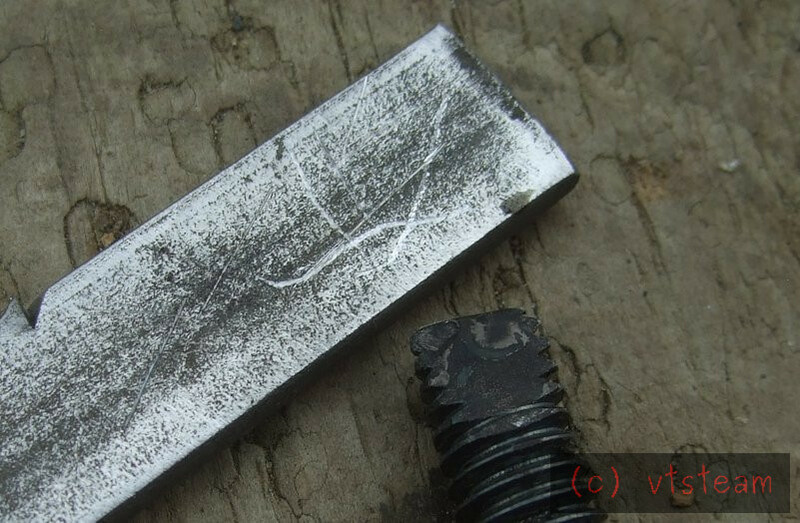 [Samurai blacksmiths used this technique to make the high-carbon steel for laminating their blades.] It is known as a Time-Temperature-Transformation in metallurgy texts. Heat Treating steel (and some other metals) is two processes: (1) Hardening, and (2) Tempering. Case Hardening (LC) steel is also two processes: (1) Carburizing, and (2) Hardening. The difference is that in case hardening the two may be combined into a single operation. Yup aware of all that Lew. VT! I really, really appreciate your systematic approach and methology on this one. Thanks Pekka, i hope something useful will eventually come out of it. Sorry sugar hasn't worked out (so far anyway). I'd really like a cheap and easy and repeateable case hardening method, and I think one will eventually happen. The retort/sealed vessel methods take a lot of time and fuel. I've got some ideas I haven't yet had time to try for simplifying that. Im sure there must be an inexpensive and reliable solution. I wish I was able to contribute but don't have the equipment or time at the moment. Certain steels are designated for case hardening presumably as they take a decent depth easily. I wonder what they contain to achieve that property? The speed/depth of carburisation will be diffusion controlled (temperature & time), largely regardless of steel composition. Steel chemistry may be modified with other elements to further increase hardenability, or to promote fine & uniform grain size in core (toughness, reduced distortion on quenching), or to improve machinability. Typically larger or more highly stressed components will require higher alloy addition (and hence more expensive) steels. Naturally. 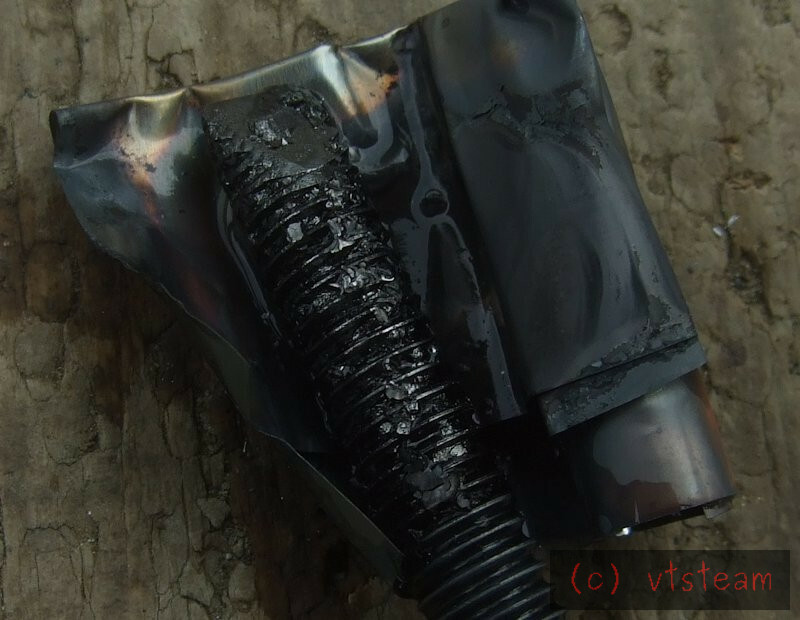 my interest in making case hardening more easily do-able in the home workshop is aimed at non-specialty steels. Rob you can use any source you want -- no rules here! Potassium ferrocyanide (prussiate of potash) is one of the reported ingredients in Kasenit. Although the can of Kasenit I have contains dark gray contents, not light yellow, so I assume it is only a component of a mix, not the pure compound -- unless the formula had changed when I bought mine. While described as non-poisonous in itself, (and even used as an anti-caking agent in food) it must be kept away from strong acids in order not to liberate deadly hydrocyannic acid. My concerns are in any experimental mix people may come up with using other unknown chemicals in combination and subjected to heat, forming acids or otherwise liberating HCN. I would avoid using potassium ferrocyaanide as a mix with anything else unless you are absolutely certain of the chemical reactions that will occur at high temperatures. As a precaution, also, I only case harden with Kasenit outdoors. What I am going to try is tapping a thread into some different samples of hardwood blocks and screw in a piece of low carbon threaded rod. Seal them up in a tin from air and pop them into the wood stove to bake and see if the steel will take on a case of carbon......OZ. I agrree about the look of Kasenite. Mine looked like a mixture of black, grey and white stuff(and some might have been crystaline and some amorphous). Definitely no signs of a yellow crystals. Hydrogen Cyanide is actually less toxic than Hydrogen Sulphide (Rotten Egg Gas)(H2S that every school lab made in the infamous Kipps Apparatus (H2SO4 and FeS). Also H2S has the sneaky property that it smells like rotten eggs in minute concentrations but as the concentration rises to toxic levels the olfactory senses (Nose) shuts down and no longer smells it. This is why so many people are killed on farms by entering slurry pits and the like! I've been thinking about doing a stupid experiment to see if sodium ferrocyanide releases hydrogen cyanide when hot (600°Cish) in the presence of water vapour. Can't find any of it for sale in the usual places though. I did chemistry at university and it's amazing how much i've forgotten over the last year and a bit. I'd like to be brainy and try figure it out with maths but it's all gone. Either way I think it'd be doubtful, the iron-cyanide bond is very strong. But it's all pointless if it's impossible to buy (in the UK at least. There's an ebay seller in the US with it). I'm probably on a watchlist now after searching for chemicals. Actually, in the torch and plunge method (ala Kasenit) it is used in the open and in flame -- that was my concern re. mixing it with other home brew chemistry. I think "torch and plunge" is far preferrable for a thin case to heated sealed packs, since it wastes very little product, uses little fuel, almost no prep work or equipment, and is very quick. One step toward developing a torch and plunge case is i believe creating a molten shell that keps out oxygen. For this, I was thinking of something like borax or sodium carbonate. (Interestingly sodium carbonate's fusion temperature is about 1650 F -- right at the temperature often specified for case hardening.) But I wasn't considering these fluxes in conjunction with any of the cyanide compounds. I don't like chemistry experiments of this sort where I don't absolutely know the byproducts and effects. Instead, I was thinking of some organic carbon source in powder form with either or both of the fluxes. Preferably one with a little nitrogen as well (protein) -- might get a little organic CN action in there after alll. I'm thinking sanded hard leather scraps (powder), since it's traditional in sealed pack hardening. Maybe a rawhide chew toy for dogs. Don't know if it's ever been tried in a torch and plunge formula. The smell should be interesting! Might be interesting to try almonds or apple seeds in a case pack too if ferrocyanide compounds are unavailable for that! Andrew, thanks -- I'm not sure what laurel, there, is... Here we have all kinds of things called laurel, depending on where you live in the country, or what you've planted as an ornamental. Have you got a genus name for the kind you have? Re. cyanide containing pure compounds here. The discussion is making me uncomfortable, since my hope was finding safe and readily available ingredients and methods for case hardening as alternatives to those compounds. I think it may be possible to do that, and I hope, with reductions in the need for prolonged high temperatures in a traditional pack case hardening method. 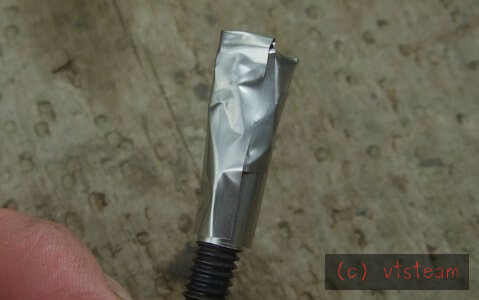 It would be nice to have a method which provides a thin case for hardening taps and cutters for occasional use that took a half hour or less, and didn't consume large amounts of fuel in the process. Or require a specialty oven. That's my hope. I can't stop people from pursuing cyanide chemistry for case hardening, but I hope great care is taken, and the risks are not minimized here in this thread (ie. is cyanide gas more or less dangerous than hydrogen sulfide). And people realize that at elevated temperatures and in combination with other compounds, a little bit of knowledge here is NOT sufficient. Further, as has been mentioned, there may be restrictions on commercial availability now for legitimate reasons. That is why I started his thread - to find a useful alternative to all of these potential issues. The experimentation I hoped for, and hope to do, is in trying alternatives. We don't have that, Andrew, but we do have a lot of wild black cherry trees growing on our land, which could be tried. I think though that if I did, I'd only want to try that in a sealed pack, again, even though "natural".